We’re on Day 3 of the 7 Days to Rediscovering Your Blogging Groove. On Day 1 we wrote a list. On Day 2 we answered a question. Then write a review on your blog. Review a book, a product, a service, another blog even. Remember to include a link to this post in your post. Here’s Write Tribe’s post ‘Write A Review’ post. 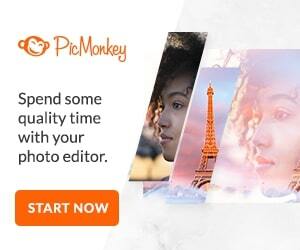 Today I’m reviewing my favourite picture editing software – PicMonkey. You can upload any photograph you have on your computer and edit it to make it beautiful. I find photo-editing necessary for photographs I’ve taken and want to put on my blogs. You can resize, crop, sharpen, remove blemishes and add or remove color to your pictures. PicMonkey is great for making collages and blog images with text. There are a large variety of themes, backgrounds, borders, fonts and stamps for you to play around with and be creative. You don’t have to sign up for free use. Easy to use for a non-professional. You access on the internet – no software to be downloaded. You can edit your Facebook photographs via the Facebook App. If you’re on Chrome, then the Chrome app is good. Has a tendency to hang with very large-sized photographs. Ads if you’re on a free account and it stores cookies, if you have a problem with that. $4.99 per month – billed monthly and allows you full access to all of the filters and features of the app. $33 per year – billed annually which works out to $2.75 per month. There are a lot of great online image editing software choices out there including the new Canva, but I find PicMonkey so easy to use! Try it today and let me know what you think. Check out all the fun stuff you can do on PicMonkey for Halloween! PS: Yes, because we love it, Write Tribe is a PicMonkey affiliate. This linky is to be used for your ‘Write A Review Post’ and if you are Write Tribe Pro Blogger, this is the linky for the week (13-19 October).